Heat oven to 350°F (325°F for dark or nonstick pan). Grease bottom of 9-inch square pan with shortening or cooking spray. In medium bowl, beat cream cheese, sugar, cherries, cherry juice and egg with electric mixer on medium speed until smooth; set aside. Make brownie batter as directed on box. In small bowl, place 3/4 cup of the brownie batter; set aside. Spread remaining batter in pan. Spoon filling by tablespoonfuls evenly onto batter. Spoon reserved 3/4 cup brownie batter over filling. Cute through mixture several times with knife for marbled design. Bake 30 to 35 minutes or until toothpick inserted 2 inches from side of pan comes out almost clean. Cool completely on cooling rack, about 1 1/2 hours. Cut into 4 rows by 4 rows. Store covered in refrigerator. 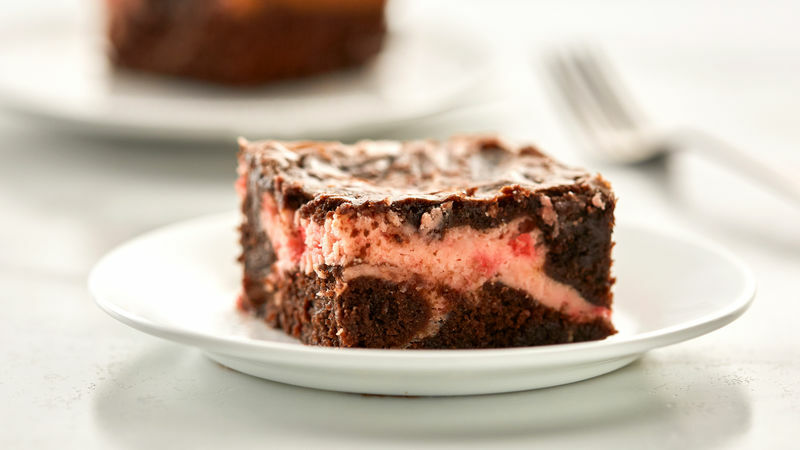 To make a pinker filling, add a few drops of red gel food color when making the cream cheese filling. Using a plastic knife for fudgy, moist brownies makes cutting them easier.